Professional photography is an incredibly important element in any real estate transaction, but especially when it comes to the luxury market. And today’s special guest is an absolute rockstar in the realm of real estate photography. Allow me to introduce my good friend Brad Filliponi, who is joining us all the way from Australia, where he’s been in business with his company, Boxbrownie.com, for 15 years. If you’re anything like me, Brad’s company name may have struck you as a little out there. The story behind it, though, is actually very interesting. Back in 1903, Kodak introduced the first mass-produced camera. It was called the “brownie camera.” So, this product name, combined with a reference to the product’s boxy shape, is what would come to inspire Brad’s own company name. As you might expect, Brad’s creativity extends well beyond his company name. His work is carried out with quality in mind. And Brad knows full well that when photographing homes, the quality of the photos is as important as what the photographer takes in the photo. This is why Brad recommends people look at his pre-photography checklist and prepare their homes accordingly before he comes in with his camera. Following this pre-photography checklist not only helps get homes into photo-ready shape, it also helps people improve how their property may perform during an inspection. A few simple preparations are all it takes for Brad to extract a home’s full potential from behind his camera lens. Once it’s time to take photos, Brad does so knowing that there is one major rule of thumb to keep in mind regarding real estate photography. That rule? Get people’s attention. But taking great photos isn’t all Brad and his company are capable of—they also do photo enhancement. They can make a picture taken on a cloudy day look like it was captured during blue skies, for example. They can also green up grass, remove cars from driveways, and even digitally stage a home. 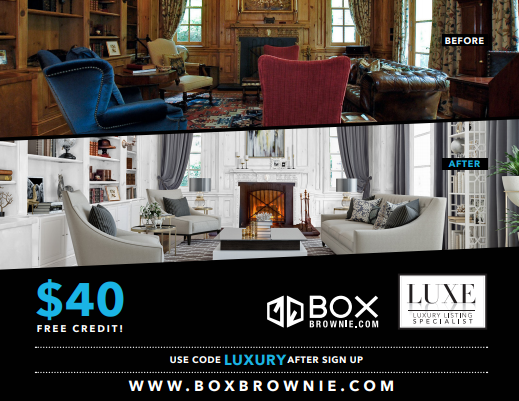 You can find out more about Brad’s company and enjoy any of the services they offer by visiting www.boxbrownie.com.You can also enjoy $40 free credit by using my special code by clicking here. Amazing results aren’t the only thing you can expect when working with Brad and his company. The prices you pay for these services are also very reasonable. Some services, like adding blue skies to a photo, cost as low as $2. And their No.1-selling enhancement, digitally staging, costs just $32. Boxbrownie.com is truly the go-to place for all of your real estate photography needs. Finally, as I always say: It’s not the marketing, it’s the market. While Brad handles the photography end of things, my group and I are experts on all things luxury real estate. And you could be too. When you sign up for our certification class, you too can set yourself on the path to becoming a certified luxury listing specialist. To learn more about this, go to www.luxurylistingspecialist.com. If you have any other questions for me or would like more information, feel free to give me a call or send me an email. I look forward to hearing from you soon.